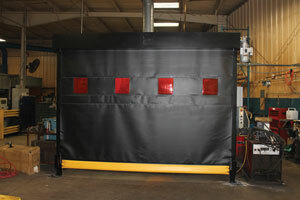 The Guardian Defender automated barrier door is designed to guard machinery, contain processes and protect employees from robotic/machine movement zones. It features a resilient curtain material that resists a wide array of application-driven hazards. It contains fumes, sparks, smoke, mist, flying debris, excess noise and other common manufacturing process byproducts.